Reason, Morality, and Law: The Philosophy of John Finnis, edited by John Keown and Robert P. George, is the best festschrift I have ever read. Long-time collaborators in the New Natural Law project, such as Germain Grisez, Joseph Boyle, and Robert P. George, contribute essays, as do prominent critics of Finnis such as Anthony Kenny, Jeremy Waldron, and Joseph Raz. Also included in the mix are critiques from what might be called the Classic Natural Law approach, represented by Kevin Flannery, SJ, and John Haldane. All of these essays, much like the work of Finnis himself, are incredibly wide-ranging. The topics they tackle include the role of judges in cases prior to the adoption of a new constitution, the proper interpretation of the plays of Shakespeare, the mens rea for murder, and the experience of the blessed in heavenly fulfillment after death. At the conclusion of the book, Finnis responds to each of the prior twenty-seven essays, correcting, extending, and concluding their remarks. The book also includes a very helpful bibliography of published works by Finnis as well as a table of contents of the Oxford University Press’s five-volume Collected Essays of John Finnis. I hope I may be forgiven if a review of a six-hundred-page book composed by so many authors does not touch on every essay. For the sake of brevity, I’ll mention only a few highlights. Luke Gormally, son-in-law of Peter Geach and Elizabeth Anscombe, sees important contradictions between Finnis’s understanding of intention and Anscombe’s. Even though Finnis sympathetically draws on Anscombe, he has also charged her with inconsistency in her treatment of various cases. Gormally defends Anscombe against this charge by drawing upon a hitherto unknown work of Anscombe, which deals with craniotomy and with the hypothetical case of a man being transfixed with an arrow. This single hand-written sheet is reproduced in full in the book. Though these cases are certainly interesting and worthy of study, the fact that Anscombe did not publish her reflections on them anywhere suggests that even she may not have viewed this articulation as her settled thoughts on the matter. The fine distinctions under discussion have important real-world consequences in, for example, the separation of conjoined twins doomed to die if not separated. On Gormally’s view, Anscombe’s understanding of intention renders such operations impermissible because they constitute intentionally mutilating one twin in order to save the life of the other. If an effect is not the reason, as a means or an end, for which an agent performs an act, then the effect is not intended, even if it necessarily accompanies intended effects (think, for example, of the effect of wearing out running shoes with the intention of getting in shape). Patrick Lee’s essay, “The Basis for Being a Subject of Rights” develops Finnis’s rejection of body-self dualism. Lee argues that “I” am not simply my thoughts, beliefs, and desires, as opposed to my body, which is merely a kind of vehicle housing the real and purely mental “me.” Suppose that I would die if I did not undergo brain surgery that would erase my memories, beliefs, and desires. Following the surgery, I would have to relearn to talk and reconnect with all those whom I love. As Lee points out, “If someone told me that, although I will not remember who I am, I will suffer excruciating pain after the surgery, I would be very afraid.” But this reaction only makes sense if the “I” before the surgery is the same as the “I” after the surgery. I am the one who is afraid before the surgery, I undergo the surgery, then I suffer afterwards. We can underscore Lee’s and Finnis’s rejection of body-self dualism by considering the case of twin three-year-old girls. Let’s call them Sophia and Madison. The girls survive a car crash, but both have memory loss. Sophia will eventually recover most of her memories, but Madison will never recover hers. If the right to live depends upon psychological connections, to kill Sophia is seriously wrong, but to kill Madison is not. The identical twins have radically different moral statuses only because one will recover a few memories and the other will not. This is hard to believe. Moreover, the car accident both destroyed a person and (supposing Madison is not killed) led to the creation of a new person. Examples such as these make clear that we are not constituted simply by beliefs, memories, and desires. Indeed, a rejection of body-self dualism is essential for a sound bioethics. If bioethics is to support more than medibusiness and the bioethics industry itself, it must follow the best of recent moral philosophy into the richly textured terrain of human goods, norms and commitments, nature and supernatural virtues, narratives, communities, and tradition. John Keown points to a better method in bioethics provided by Finnis himself, arguing that he should be recognized “as a leading authority on the law and ethics of medicine.” Part of the power of his contribution is to push back against an ungrounded emphasis on autonomy in bioethical questions. As Keown notes, “If nothing else about human existence is of objective importance, why should the individual’s opinion be so?” If the being in question does not matter to begin with, it is hard to see why we should care about the being’s preferences, desires, autonomy, or other subjective inclinations. How could an individual’s desiring of life give the life value, unless the individual has value? If the human person in question does not matter to begin with, it is hard to see why we should care about the human person’s preferences, desires, or other subjective inclinations. The autonomy of human persons matters because human persons matter. Indeed, Finnis argues that the idea that your life has value only because you value it is vague, arbitrary, discriminatory, and dualistic. The desire-dependent view of a human being’s value is vague, because we do not know specifically when this begins or how long this lasts. It is arbitrary, because in some cases we think people not desiring their own lives are still valuable, as in many cases of suicide prevention. It is discriminatory against the depressed, the mentally handicapped, the injured, the intoxicated, and the brainwashed. Finally, the desire-dependent view is at least implicitly dualistic, supposing that “we” exist only when our desires begin to exist. Our bodies are not mere vehicles by which we transport our purely mental selves. The debate about the significance of such apparent variation in permitted state coercion is proving interminable. Indeed the debate seems impossible to resolve when limited to the history of teaching specifically on the state. And now we see why. For all along the real coercive authority in religion was the Church, not the state. The Church, in Pink’s view, may coerce belief as well as practice. The baptized have obligations to God and to the Church, and the faithful may be coerced to meet these obligations. State coercion in religion rested upon an ecclesiastical policy of directing baptized persons in political authority to use governmental means to aid the Church in ecclesial coercive efforts. The same good of dignity, responsibility, and authenticity in inquiries and commitments about religious matters, the good that unconditionally excludes trying to coerce someone into faith, equally excludes trying to coerce someone back to faith. The Church may discipline its members and impose penalties upon them, but the penalties are not aimed at coercing belief. The Church is a voluntary association. The penalties for heresy and apostasy, as for the other offences known to canon law, are just as you would expect: deprivation of the benefits of membership (excommunication, deprivation of ecclesiastical office, and the like). They are justifiable not as intended to pressure to faith but as intended to protect the household and vindicate its due order. Both Pink’s and Finnis’s contribution go well beyond anything I’ve read about the proper interpretation of Dignitas humanae. Further research on these issues should now begin with them. I wish Keown and George had included a contribution from Jeff McMahan, who is perhaps the most powerful critic of the views Finnis defends. I also wish George had returned in his contribution to some of the disagreements that he has had with Finnis over the years, such as the role of government in encouraging morality. But these are mere quibbles that hardly detract from a truly outstanding book, which is a fitting honor to the spectacular achievement of John Finnis. 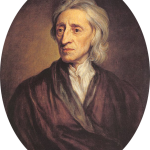 John Locke is an illustration of how social contract theory distorts sound political reasoning.